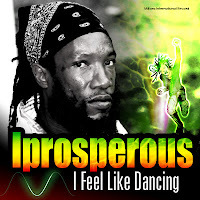 Reggae artiste Iprosperous is said to have a striking resemblance of fellow Jamaican Reggae crooner Junior Kelly whose career accelerated after the release of hit song, If Love So Nice. But though they might look alike, the only thing both have in common are their crown of 'dread locks' and Jamaican nationality. Iprosperous who once went by the name 'Natural I' changed that name in 2011 after signing with Millionz International Records and totally revamped his career. The label released two singles entitle, "I Feel Like Dancing" and "Feeling Good Ina Mi-self" both currently receiving continuous spins on local radio. The focus now, is making Iprosperous its first internationally recognized artiste within the Reggae music industry. Artiste Manager and C.E.O. of Millionz International Records Andrew Duggan, brought Iprosperous on board because he loves his music and believes in the artiste, "his (Iprosperous) music is like a breath of fresh air" he said. "It's (lyrics) simple and puts a smile on your face when you think of, i feel like dancing and feeling good ina me self it takes you to the child in you and this makes the music complete." It sure does...these are the kind of songs Iprosperous sings, what he brings to the industry is 'harmony' contentment and happiness. "It don't mean dat me walk around wid me head in the sky..no no dats not wat me saying..what me want people who listen to my music to feel..is the will to move on...despite whatever challenge dem face" said Iprosperous. Junior Kelly is re-known while Iprosperous is yet to make his name and is hopeful that his time will come sooner than later. 'I Feel Like Dancing' is now available for download on Itunes, AmazonMP3, eMusic, Rhapsody, Spotify and other digital download retail online stores worldwide. Listen Iprosperous music on Sound Cloud and become his fan on Facebook.